An optical amplifier is nothing but a laser diode without feedback. Which introduce in 1990. It is mainly used the inline optical amplifier. Semiconductor optical amplifier is a laser diode without an end mirror. It is a most important technology provides high-speed switching capability, high extinction ratio, gain etc. There are many types of optical amplifier namely semiconductor optical amplifier ( SOA ) like erbium doped optical amplifier ( EDFA ), Raman amplifier. This article will make a clearer introduction to semiconductor optical amplifier ( SOA ). Similar to laser but with nonreflecting ends and broad wavelength emission. In this amplifier, incoming optical signal stimulates emission of light at its own wavelength. The process continues through the cavity to amplify a signal. Semiconductor optical amplifier consumes less power and it can use fewer component. 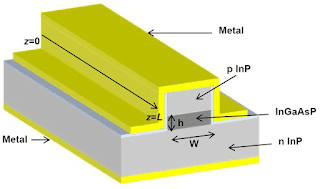 Active medium consists of an alloy semiconductor ( Ga, P, In, As ). It works in both attenuation windows, 1300 nm, and 1500 nm. It very broad gain spectrum. High fiber to fiber gain 20 dB. Semiconductor optical amplifier has rapid gain response 1 ps to 0.1 ns. An SOA work in a similar way to a basic laser. As a name suggested are used to amplify the optical signal. A typical structure of InGaAsP/InP structure of given below. The structure is much the same, with two specially designed slabs of semiconductor material on top of each other, with another material between them forming the active layer. The smaller bandgap intrinsic region has a smaller refractive index than the wider bandgap p doped and n doped quasineutral region. The intrinsic region forms the core of the optical waveguide and the quasi-neutral region form the claddings. Current injection into the intrinsic region can create a large population of electron and holes. During the operation as an optical amplifier, light is coupled into the waveguide at Z=0. As the light propagates inside the waveguide it gets amplified and finally when the light at Z=L, its power is much higher compared to what it was at Z=0. Smaller output power then EDFA. It can be run with a low power laser. In this amplifier all types of nonlinear operation like cross-phase modulation, cross gain modulation can be conducted.